Alginate has several biomedical uses already. It's used in wound dressings and in the goop dentists use to make dental impressions. Here it forms capsules around mesenchymal stem cells. Stem cell therapy for heart disease is happening. Around the world, thousands of heart disease patients have been treated in clinical studies with some form of bone marrow cells or stem cells. But in many of those studies, the actual impact on heart function was modest or inconsistent. One reason is that most of the cells either don’t stay in the heart or die soon after being introduced into the body. Researchers used encapsulated mesenchymal stem cells to form a "patch" that was applied to the hearts of rats after a heart attack. Compared with animals treated with naked cells (or with nothing), rats treated with the capsule patches displayed increased heart function, reduced scar size and more growth of new blood vessels a month later. 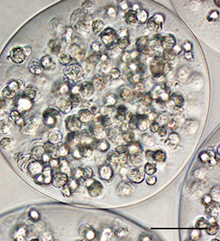 In addition, many more of the encapsulated cells stayed alive. "This approach appears to be an effective way to increase cell retention and survival in the context of cardiac cell therapy," says W. Robert Taylor, MD, professor of medicine and director of the cardiology division at Emory University School of Medicine and professor in the Wallace H. Coulter Department of Biomedical Engineering at Georgia Tech and Emory. "It may be a strategy applicable to many cell types for regenerative therapy in cardiovascular disease." The results were published October 10 in the Journal of the American Heart Association. The first author is cardiovascular research fellow Rebecca Levit, MD. She and her colleagues collaborated with the laboratory of Andres Garcia, PhD, in the George W. Woodruff School of Mechanical Engineering at Georgia Tech, in developing the patch used to apply the encapsulated cells. "These cells are social creatures -- they like to be together," he says. "From some studies of cell therapy after myocardial infarction, one can estimate that more than 90 percent of the cells are lost in the first hour. With numbers like that, it’s easy to make the case that retention is the first place to look to boost effectiveness." Encapsulation keeps the mesenchymal stem cells together in the heart and keeps them happy. It allows them to sense the outside environment and release smaller proteins such as the growth factors the cells produce, while preventing larger proteins such as antibodies from coming in and spoiling the party. Alginate, the material used to encapsulate the stem cells, has plenty of biomedical and culinary uses already. It’s a cooking tool in the hands of inventive chefs, and it’s part of wound dressings and the goop dentists use to take impressions of someone’s teeth. Collin Weber, MD, a diabetes researcher at Emory and a co-author on the paper, has been using alginate to encapsulate insulin-producing islet cells, and alginate-encapsulated islets are being tested in clinical trials for diabetes. Encasing cells in a gel does prevent cells from becoming part of the cardiac muscle tissue and replacing cells that have died – but mesenchymal stem cells aren’t really expected to do that anyway. A month after an artificial heart attack, rat hearts’ ejection fraction – a measure of how much the volume of blood in the heart changes when it pumps -- fell from 72 percent to 34 percent. When rats were treated with encapsulated mesenchymal stem cells, the ejection fraction was 56 percent, a substantial improvement, but when rats were treated with naked cells, the ejection fraction was 39 percent, not as much. One of the main effects of the stem cells seems to be in promoting blood vessel growth; in capsule-treated rats, the damaged area of the heart had a density of blood vessels several times that of controls. In a clinical setting, Taylor says the goal is to use a patient’s own (autologous) cells as a source for cell therapy materials. A source for mesenchymal stem cells could be obtained from the patient’s bone marrow. The cells would need to grow outside the body for several days in a facility like the Emory Personalized Immunotherapy Center to have enough for a therapeutic effect. The research was supported by a gift from Jake Aronov.